3 Bedroom Flat For Sale in Sidmouth for Fixed Price £400,000. Sidcliffe House was built in the late 1700's/early 1800's and was a former holiday home for a London banker. 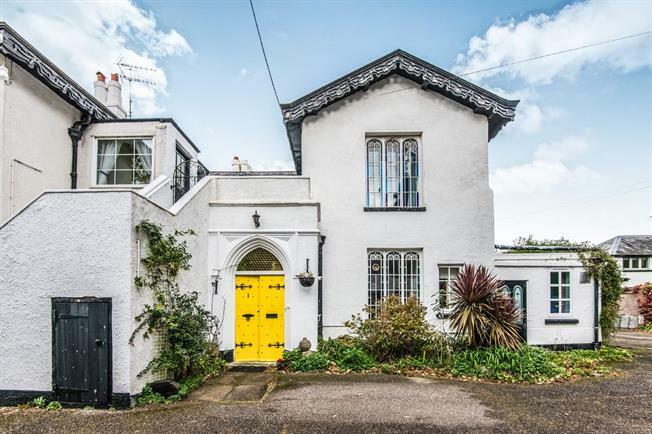 This Grade II listed property was then converted into flats once sold. The flat itself still holds the original charm and characteristics of the original form building with its wooden window shutters, high ceilings and beautiful stain glass windows. In addition this property boasts its own garden, parking and single garage in a nearby block. To fully appreciate this rather special property we strongly recommend an early viewing. Wooden double door, with frosted windows in arch above the main door. Inside porch the boiler is located with natural stone flooring. Stained glass double door archway from entrance porch. Doors leading to bedroom on and two, bathroom and kitchen, plus skylight window enhancing the light in the hallway. Front aspect stain glassed bay window with wooden window bench seat. Wooden shutters, radiator, door leading to second hallway. Comprising of storage cupboards and door to bedroom one, door to shower room and bedroom three. Close coupled WC, pedestal wash hand basin, electric shower with shower tray and bi-fold glass doors. Wooden glazed door leading outside and front aspect wooden window. Radiator. Double stain glass doors in arch leading to master bedroom comprising of feature fireplace, wardrobes, door leading to Living Room and window to hallway. Radiator. Fantastic bay with three separate double stain glassed arched doors leading to garden and sun terrace. Feature fireplace. Doors leading to kitchen and master bedroom. Double doors leading to the sun terrace and to the garden. Two front aspect wooden bay windows, floor and wall mounted kitchen units, with Belfast sink and mixer tap, inset oven and electric hob with stainless steel extractor fan, marble work surface. Doors leading to hallway and living room. Oval cream bath with mixer tap with extendable shower head and hose. Front aspect frosted wooden windows, vanity unit wash hand basin and including a close coupled WC, alcove with storage boxes. From the kitchen and living doors you enter onto a sun terrace with steps leading into a well established garden with winding gravel paths taking you around the garden.